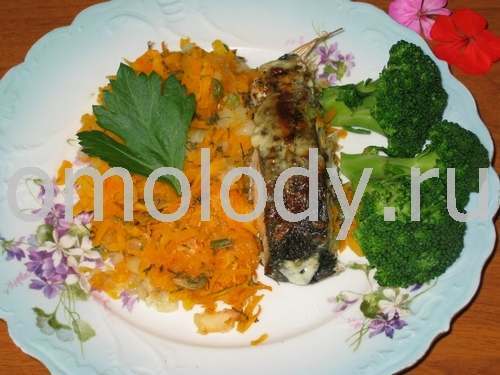 Codfish baked with carrot, fish recipes. ground pepper, salt, ground coriander, Celery leaves to taste. 1. Put chopped potato into greased skillet. Over the potato put layer of chopped onion and grated carrot. 2. On top put the fish fillet and sprinkle with spices. 3. Bake uncovered for 40 - 50 minutes. 6 to 10 minutes before the fish is cooked, sprinkle with Mayonnaise. Serve hot fish and vegetables with cooked broccoli and Celery in each plate.